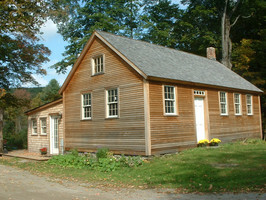 Come stay in our 18th century fully renovated schoolhouse in scenic Southern Vermont. 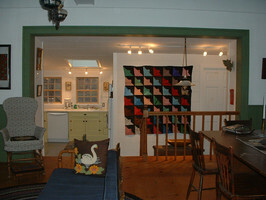 Furnished with Americana, the schoolhouse offers two bedrooms, full bath, and a fully equipped kitchen. (One bedroom, kitchen and bath are wheelchair accessible.) Bathroom features tub, shower, and washer/dryer. Seven skylights offer views of ancient maples, blue sky and stars. Relax in the hot tub on the back deck after your day's adventure. Both bedrooms feature double beds, and a pullout couch in the living room provides additional sleeping space if needed. Bedrooms are furnished with built-in custom cabinetry. Numerous restaurants serving everything from haute cuisine to sandwiches and pizza. Enjoy the local scenery by hiking, snow-shoeing or cross-country skiing right out the front door, or find cross-country ski trails in nearby Grafton. The local area is full of swimmable rivers and ponds, hiking trails and fishing streams. The Crumpin' Fox Golf Club is about 8 miles away in Bernardston, Mass. The Franklin Farm at the bottom of the hill offers organic maple syrup, fresh eggs and other farm products for sale in their store. $700/week (plus a $100 cleaning deposit fully refundable if you leave the place clean). Price includes breakfast fixings (organic eggs from the local farm, sausage or bacon, maple syrup, bagels or muffins, granola, coffee and tea) provided on arrival. 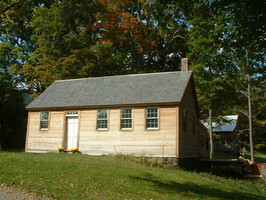 Guests in the schoolhouse get a 20% discount on classes at neighboring Otter Pond Bindery. They may also arrange for private lessons in bookbinding at an hourly rate.